Hello, It’s me again. I just got back from my second US tour in as many months. It was such a joy and a dream to travel around North America and sing for new audiences. The drives were long and as such, so were the playlists. 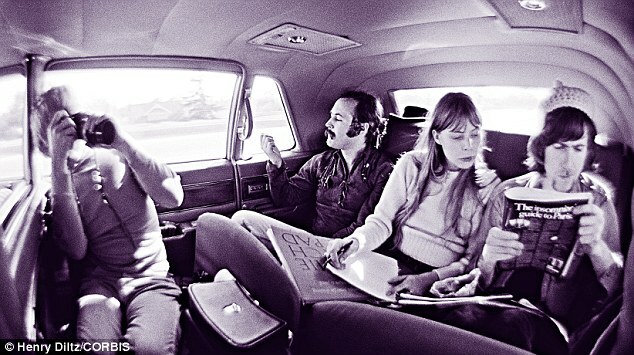 I couldn’t help spinning my favourite songs of the late 60s and early 70s as we drove down the Californian coastline. 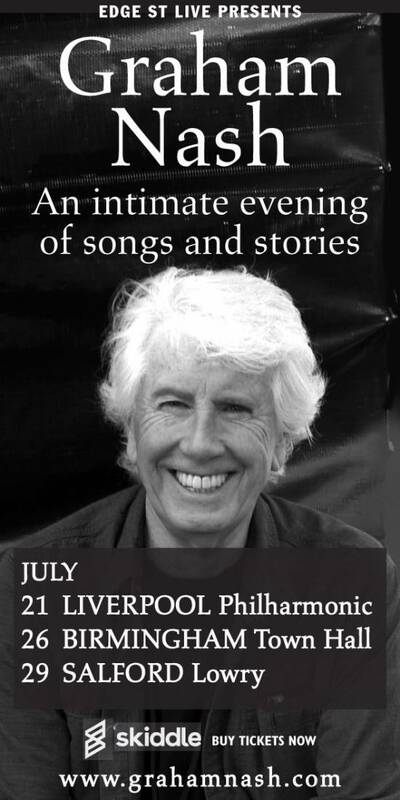 Jackson Browne, Joni Mitchell, CSNY, The Beach Boys, Jim Croce to name a few. With such great songs and great sights I knew I wanted to document this experience in some way. So, as we travelled, in motels and dressing rooms I began to record my own versions of the songs that were soundtracking the tour. My new single ‘Thirteen’ was recorded during those days on tour. It is the second single from my upcoming EP ‘Just A Song Before I Go’ out on the 12th January. You can listen to it below. The Live Version of ‘Just A Song Before I Go’, I just love this song. It’s an effortlessly good driving song, perhaps owing to the fact that Graham Nash wrote it whilst in a taxi to the airport after his driver bet him he couldn’t write a song during the 15 minute drive. 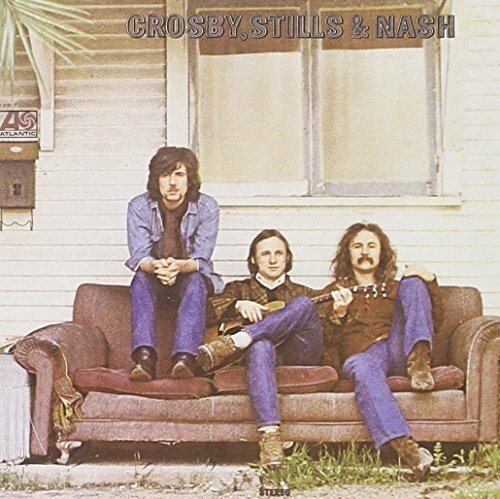 From the preliminary planning stages of Crosby, Stills & Nash, the musicians had always planned to pursue solo projects in conjunction with working together. 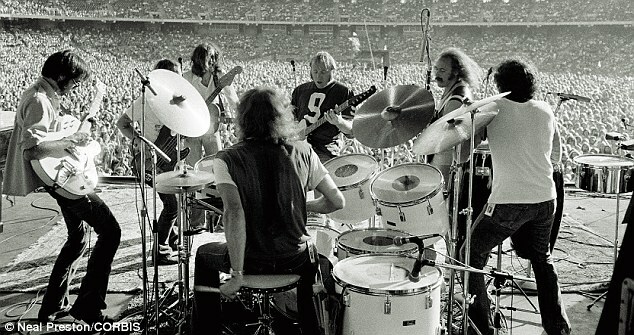 Following the monumental success of the debut album in 1969 and its follow-up, “Déjà Vu”, in 1970, brought Neil Young into the fold, each of the band members remained quite active on their own. By 1973, a wealth of solo material had been released and each of these musicians had established themselves as individual songwriters and musicians. 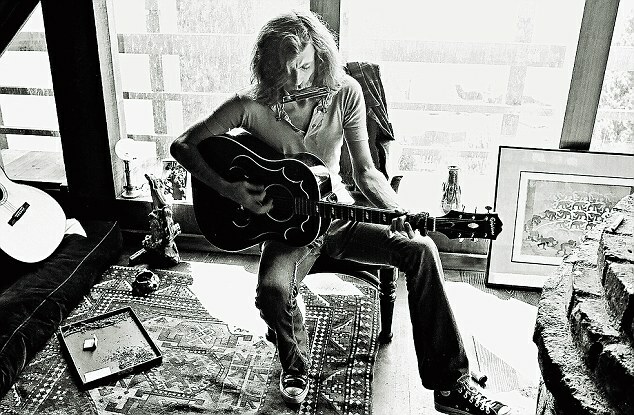 Crosby, with help from many of the San Francisco elite, had released his first solo album, “If Only I Could Remember My Name”. 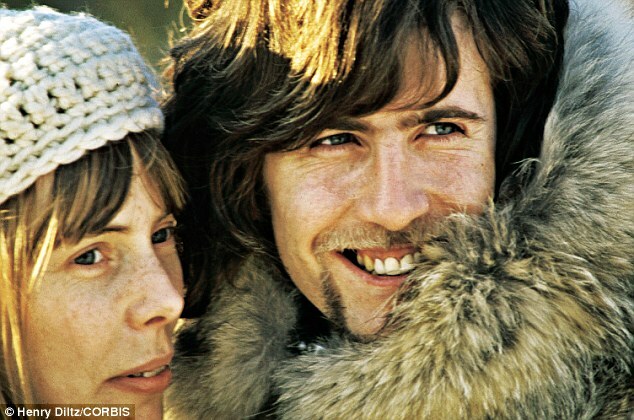 likewise for Graham Nash, who released his first solo album “Songs For Beginners”, and was working on a second album. 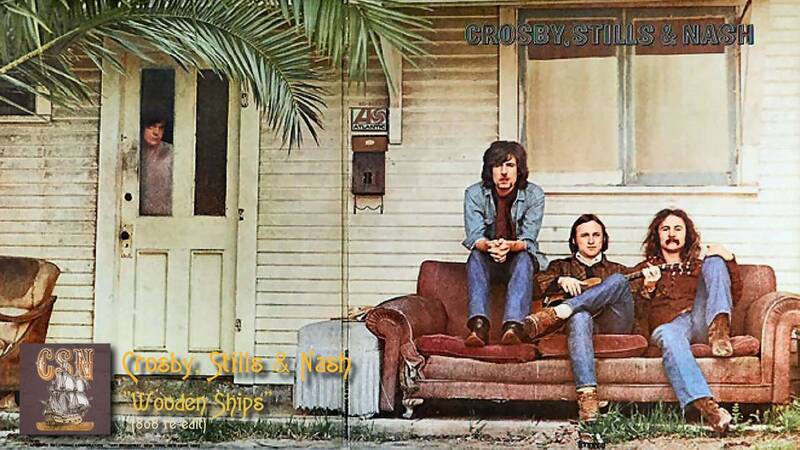 Crosby and Nash also released an impressive duo album during this time. Stephen Stills and Neil Young were even more prolific, with Stills releasing two impressive solo albums as well as a double album with his own band, Manassas, and Neil Young pumping out songs at an amazing rate, including the most popular album of his career, “Harvest”. By 1973, the clamoring for these four musicians to again work together was at an all-time high, but their well-publicized personality clashes made it seem unlikely that this would happen anytime soon. That same year, Stills took to the road with an outstanding band, Manassas, which also featured ex-Byrd Chris Hillman and several members of The Flying Burrito Brothers. booked to play two gigs at San Francisco’s Winterland on October 4th and 7th. Surprises were in store both nights, but the October 4th gig turned out to be the most delightful. Following a lengthy set by Stills and Manassas, which featured two highly-charged electric sets and a semi-acoustic set in the middle featuring Flying Burrito Brothers classics, the audience was charged up and cheering for more. When Stephen Stills returned to the stage with David Crosby and Graham Nash in tow, the audience was ecstatic! The trio hadn’t shared a stage since 1970. Strapping on acoustic guitars, they first delight the audience with two staples from their debut album: “Helplessly Hoping” and “Wooden Ships.” The harmonies are ragged and the delivery unrehearsed, but regardless, just having these musicians playing together again, and more importantly, obviously enjoying it, was a cause for celebration. 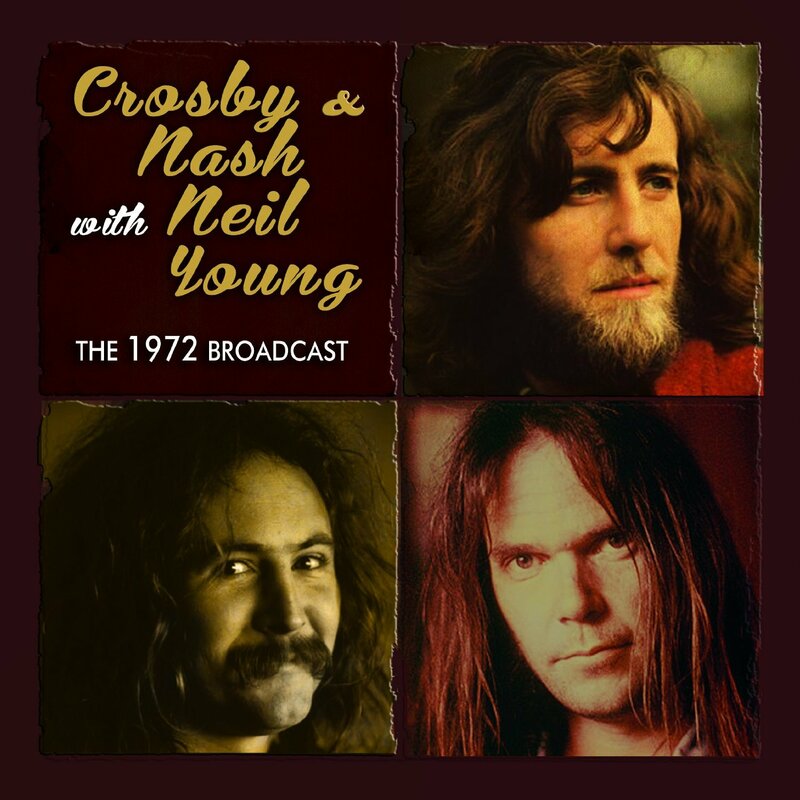 This remarkable acoustic set continues with the trio performing a lovely take of Paul McCartney’s “Blackbird,” after which Stills switches to piano for “As I Come Of Age,” a number he often performed with CSN&Y on the 1970 tour and recorded for his first solo album. 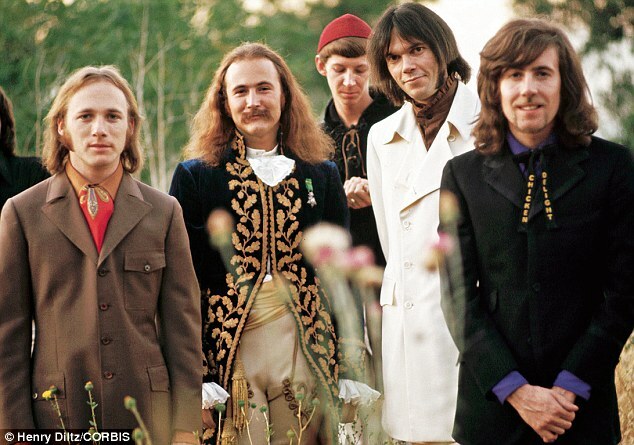 The personality clashes between Stills and Young were the most publicized of all and had been going on since the Buffalo Springfield days, so when Neil Young walks out to join the other three, the crowd goes nuts. The musical chemistry between Stills and Young had always been undeniable, but many believed they’d never see the two on the same stage again, so this was indeed a monumental moment. 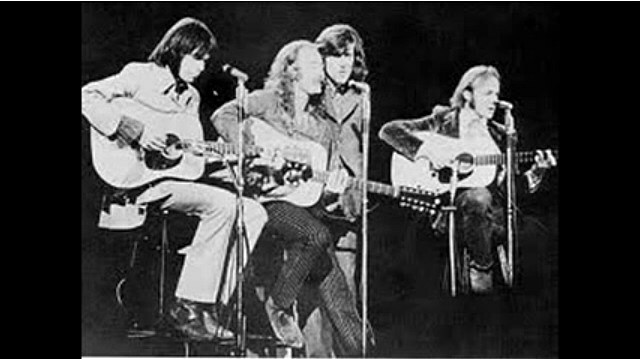 Young was just about to release his controversial “Time Fades Away” album, but in typically unexpected style proceeds to play nothing from this album, instead performing three new songs, “Roll Another Number,” “Human Highway,” and “New Mama.” The middle song was rumored to be the title song of a potential third CSN&Y project, while the other two would be destined for “Tonight’s The Night”, an album that wouldn’t see the light of day until June of 1975. Graham Nash next gets the spotlight, and he too debuts new songs, “And So It Goes” and “Prison Song,” both destined for his second solo album, Wild Tales. Crosby follows with a rare acoustic performance of “Long Time Gone” before they close the set with Stills’ “Change Partners,” the single from his second solo album. These performances are unique and the chemistry between these musicians was obviously still intact. Following these shows, all four members expressed a strong desire to tour together acoustically. It wouldn’t come to pass, but this was likely the spark that ignited the idea of touring together the following year, which is when they would indeed get back together and perform before the largest audiences of their career. 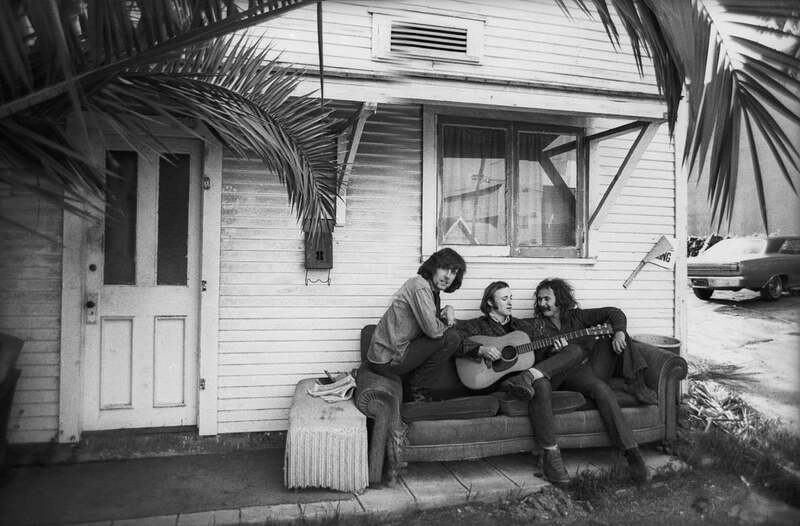 Just two months after their historic appearance at the Woodstock Festival, Crosby, Stills, Nash and Young were scheduled to play their first-ever gigs at Bill Graham’s Fillmore West and Winterland. 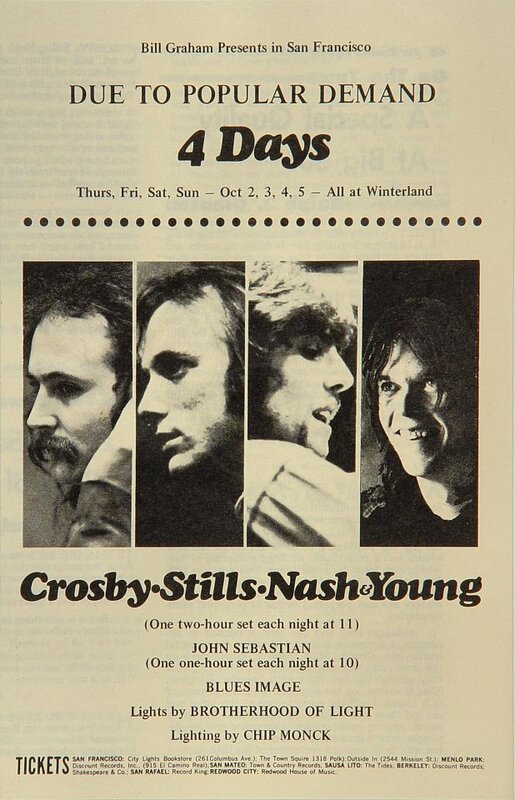 CSNY was forced to postpone the show, and Janis Joplin and Santana stepped in to replace them, along with the original billing of Blues Image and John Sebastian. The poster, however, had already gone to print. The posters artists and designer Greg Irons moved to San Francisco in 1967 and roamed around Haight-Ashbury with his sketchbook, creating images he would later use in his posters. 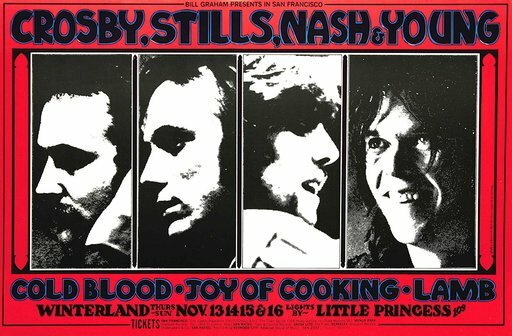 As usual, promoter Bill Graham needed a poster in a hurry, and Irons succeeded in producing one overnight. As his talent as a draftsman developed, a distinctive line quality and refined sense of balance set Irons‘ posters apart. His cartoonist inclinations are often evident, and he became one of the seminal figures in underground comics. Greg Irons also found work producing album graphics and book illustration, but it was the art of tattooing that became his passion.